My studio doubles (quadruples really) as many things when needed: making space, glazing area, gallery, as well as photo room. One of the questions I am asked frequently by fellow makers is do I shoot my own images. I do, and have from the beginning. My Dad helped me get started photographing my work way back in 1991 with film. (Remember when we called it that and used that stuff?!) Along with my Dad, John Glick (who I assisted/residencied with from 1996-97, and who also shoots his own work, even when large format, 4 x 5 was a tricky medium), helped me understand the settings on the camera, lighting, etc. And it’s really through the same two decades of practicing how to make pots that I’ve had the simultaneous practice of shooting them. Artwork almost doesn’t exist without images. (These days, maybe nothing exists without images.) Most folks see someone’s work via image (web, books, magazines), many times more than in person, if they ever see it in person at all. The image of the work can be paramount over the work itself, so good, current pix are a necessity. Once I’m ‘in it’, I like the photography part of my studio practice. As the maker, I have a unique idea of how my work should be shot and looks best (from angle to lighting to placement). While I’m making pots, I imagine how they’d be framed in an image and ponder groupings. Someday I would love to have my work professionally ‘styled in situ’ (and am not saying a pro couldn’t do even my simple, standard shots better), but for now, doing it myself also allows me to shoot frequently, so my images for publicity and the web are always current and new. So, the top image is one I composed and shot for a potential new postcard to illustrate my favorite forms, varied styles, and color pairings. 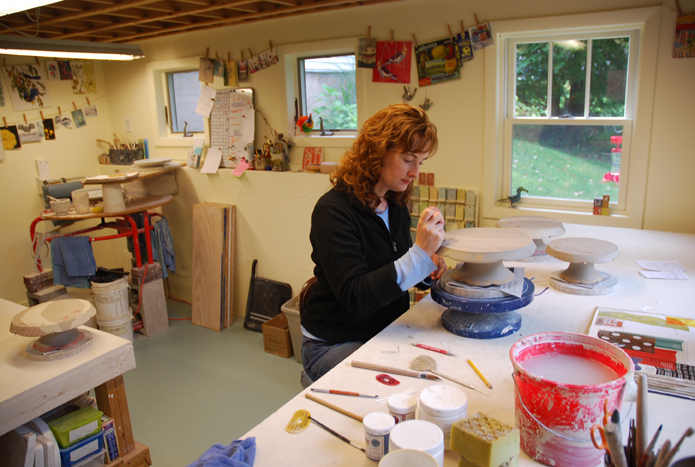 The image below is of me in my studio taken by my hubby for a needed ‘studio shot’ request by NCECA. (The table behind me is where I shot the grouping.) 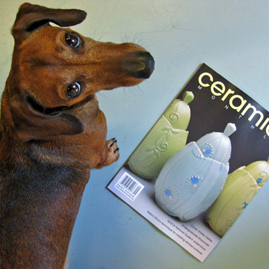 The other images below from my studio are my darling hubby acting as a stand-in for me with our new, shelter-adopted doxie, Hannah, while I try to frame up my shot, and Hannah (the reason I seem to be blogging less) posing with my CM cover when it first arrived. 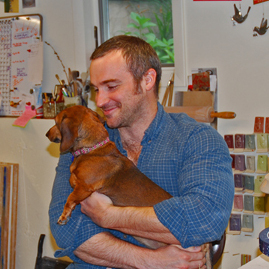 All glimpses from a week-in-the-life of my studio, which isn’t always a pottery-making studio. I think your ability to create great images is a big part of your overall ability to take in all of the things you love, and combine them in a cohesive, coherent manner. You are a stylist of the first order! As for having a pro shoot your work…. all you really get from that is a different way of seeing your work. Not that that is a bad thing, but your skills are nothing to sneeze at. Of all the potters I have met in the past two decades, your work has the best consistent branding, representation and style of anyone. No question! I would think that the only reason to ever hire a pro photographer is if you needed a new look at your work, stylistically speaking, in order to celebrate a new vision or direction (or venue) for your work. Hope that makes sense. Suffice to say, YOU ROCK! Thanks, Alex! That means a lot coming from you, a pro-photographer. I’m so pleased you followed my thoughts that I CAN shoot my own pots, but another eye would definitely bring something new and exciting too. I admire action shots of handmade, and don’t seem to have the time, lighting, and patience to give it a go myself (yet), so would love to have a dozen pots/pix with flower arrangements, table settings, etc. some day. (Part of why I have the Pinterest board ‘Props to Props’.) It’s always great to hear from you, and I appreciate the PROPS! Thank you for sharing your space. I too take photos of my work. I do not enjoy the process , but know it is nesessary. What I enjoy the most about your blog today is seeing your studio. My husband is building an addition with a studio for me. I need to see how other studios are set up as It gives me perspective and ideas. How tall is the table you work on? 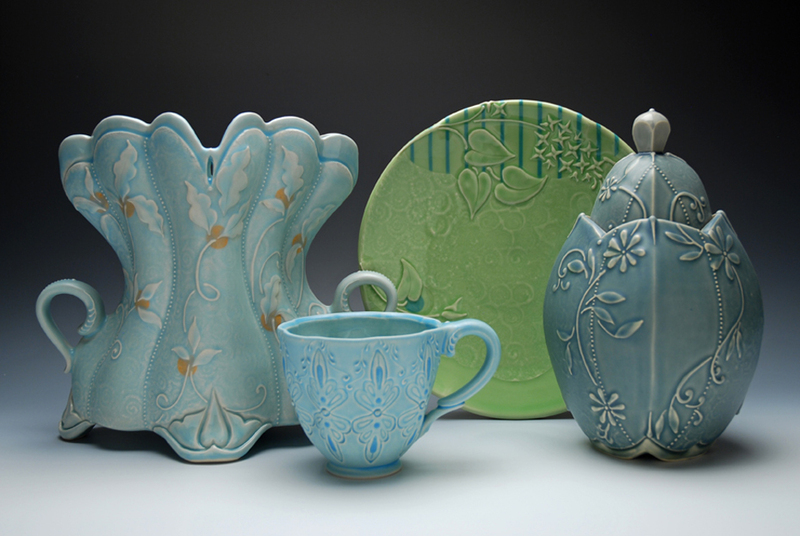 I will someday own one of your pieces, a tea cup! It is on my bucket list!